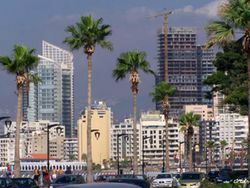 Beirut is a huge city with several district articles containing sightseeing, restaurant, nightlife and accommodation listings — have a look at each of them. Downtown - Located in the side of the city beside the Beirut port and Beirut marina; includes many shops, hotels, and Beirut souks (modern shops districts). Also home to many historical sites and old churches and mosques. Badaro - Located at the heart of Beirut, Badaro is the "Village" of Beirut in the green district. A very active Pub and Café scene with a mix of Bohemian and yuppies crowd. Hamra - A hive of activity, and a shopping-lover's paradise. Hamra became the center during the troubles in the 70's. The more popular places are Bliss st., Hamra st., Sourati st. and Jeanne d'Arc st., each havings its own share of cafés, hotels, and restaurants. Hamra st. in particular has been redeveloped in recent years, with larger chains of restaurants and cafes opening there, including Starbucks, Costa, Nandos, Roadsters, and Applebees. There has also been a revitalization of the pub scene, with over a dozen bars and pubs operating in the area. Ain El Mraiseh - Seafront district with plenty of hotels and restaurants. Manara - The north-westernmost district of Beirut. Ras Beirut literally translates to "the head of Beirut" due to its location on the tip of peninsula, home to the Manara Lighthouse and various beach clubs (though none feature any sandy beaches). 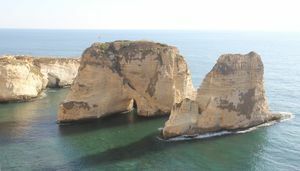 Rawcheh - The Pigeon Rocks, the focal point of this district, are located on the shore off this posh neighborhood which is Beirut's most expensive area after Downtown. Verdun - A trendy shopping area south of Hamra and east of Raouché, Rue Verdun (or Verdun st.) is the main area where you'll find many hotels and shops. The area also features cafes and restaurants. Many Gulf Arabs stay here during summer vacations. Ramlet El Baida - A residential area just south of Rawcheh, here you'll find Beirut's only public beach. It is also the only beach featuring any sand. Ashrafieh - The eastern center of the city. It is home to all kinds of shops and boutiques. Its core is Sassine Square, the highest point in Beirut. Another famous area is Sodeco Square on its utmost western edge where the notorious ruin of the beautiful Beit Beirut stands. Gemmayze - This neighbourhood east of Martyrs Square and north of Achrafieh hosts many bars and at least one nightclub called Yukunkun. Its popularity has been fading since bars opened further down Gouraud Street in Mar Mikhael's Armenia Street in the early 2010s, but it remains one of the most important magnets for party goers. Mar Mikhael - Mar Mikhael is the place to be for bar and cocktail lovers as of 2015 and is located in the north-east of Beirut. The countless bars on Armenia Street are so popular that the crowds standing in front of the bars at times occupy parts of the street. Monot Street - Technically in the central Saifi area but with a different feel from the posh boutiques in the area's core this was a popular nightspot in the first decade of the 21st century before the bar scene shifted to Gemmayze and Mar Mikhael. It still is home to several bars and restaurants. Jnah - A predominantly residential area in southern Beirut, but also home to various beach clubs and hotels. Charles Helou Station lies approximately one kilometer east of Nejmeh Square, on Charles Helou Avenue, facing the Beirut Port. From there you can take the city buses or hop onto the larger coaches that link Beirut with the neighboring cities. The two other main hubs are Cola in the south of the city and Dora in the north-eastern suburb of the same name. Beirut has survived a rough history, falling under the occupation of one empire after another,. Originally named Bêrūt, "The Wells" by the Phoenicians, Beirut's history goes back more than 5000 years. Excavations in the downtown area have unearthed layers of Phoenician, Hellenistic, Roman, Arab and Ottoman civilizations. Following World War II, Lebanon gained its independence from France and Beirut became its capital in 1943 - Bechara El-Khoury and Riad El-Solh, Lebanon's first president and prime minister respectively, are considered the founders of the modern Republic of Lebanon and national heroes. 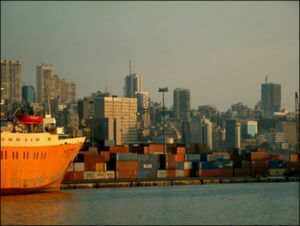 Beirut thrived as a major commercial and tourist center of the Middle East. 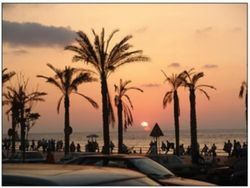 It was a top destination among wealthy Arabs and European tourists, due to Beirut's unique geography, climate, diverse culture, and freedom. Beirut was seen as the "European gateway to the Middle East" and vice versa, and was often called the "Paris of the Middle East". The city has severely suffered from a 15 year long civil war that ravaged the country from 1975 to 1990. It quickly was divided in a Western part controlled by Pan-Arabist Lebanese and Palestinian militias inclined to socialism and an eastern part under control of nationalist Lebanese militias leaning towards fascism. The front line was for most of the time along the roads Damascus Street and Old Saida Street. The central area of the city, previously the focus of much of the commercial and cultural activities, became a no-man's land. You can still find many buildings damaged or completely ruined especially on the verges of Downtown but there are hardly any efforts to keep the memory of those bloody days alive. The conflict is often misleadingly portrayed as a religious conflict that divided the city in a Muslim and a Christian part. While it is true that there were massacres along religious lines many Christians lived in West Beirut throughout the war and vice versa and most militias had Christian, Muslim, and - at least some communist factions - atheist members. Since the end of the war in 1989, the people of Lebanon have been rebuilding Beirut. The city has undertaken an aggressive rebuilding policy. It has been working hard to regain its status as a tourist, cultural and intellectual center in the Middle East which it has lost to Cairo as well as a center for commerce, fashion and media which is dominated by Dubai and other rich Gulf states. However Beirut with the rest of the Middle East has gained momentum. Most areas of Beirut have a friendly atmosphere and Beirutis have a reputation for being very polite, friendly, sociable and outgoing. The locals are used to the sight of foreigners and many of them are happy to get to know you and even to show you around the city. Sectarianism is still prevalent in Lebanon, as a result of the Ottoman religious system and of the French colonial policy of divide and rule, which is both reflected in the political system and social networks. Many Lebanese, especially Christians and the middle and upper classes, identify culturally with Europeans, particularly the French, and some denying Arab identity altogether. Many of them, and this might especially true for Christians, prefer to identify themselves as Phoenician (referring to their ancestral roots in ancient Phoas Chrienicia.) Many Muslim Lebanese on the other hand identify culturally and ethnically with other Arabs and Muslims of the Middle East. A minority claims to be Syrian in the sense of a Greater Syrian civilization stretching from Cyprus and Sinai to west Iran and from southern Turkey to northern Saudi Arabia. Most Beirutis love going out and the city offers with Tel Aviv the best night life in the whole region. If (and when) you go out at night, depending on the venue, dressing up well will most certainly get you some respect. The locals like to see that foreigners are doing what they can to fit in. Expect to be offered a drink or a cigarette. Alcohol is very cheap in shops and supermarkets, yet in night venues, prices can easily exceed European standards (aka: 8,000L.L/Beer, 15,000L.L/Cocktail)). Smoking is very common in Beirut and a large portion of the people smoke. A ban on smoking indoors in public places began September 3, 2012 but it's not easy to find a smoke-free place that enforces the laws. Beirut enjoys Mediterranean climate. Come in April to June for warm, dry days and long, cool evenings (15–25°C). Temperatures in July and August rise above 30°C and humidity can be somewhat overwhelming. Heat waves affect Beirut and temperatures can get above 35°C (95°F) and the record high is 41°C (106°F). A room with air conditioning can help to escape the heat and to sleep easily as even the night temperatures hardly drop below 25°C. The wettest months are December to February and can bring thunderstorms with lots of rain for days so bring a good coat and umbrella. Winter on the other hand is pleasantly warm with temperatures ranging between 11°C (52°F) to 17°C (63°F) but it's also really wet with more than 650 milimeters (29.5 inches) falling between November and March. Nights can get cold especially in the western suburbs due to the higher altitude but even in the city center temperatures can get as low as 5°C (42°F) once or twice every year. The record low is at exactly 0°C (32°F). Snow is extremely rare in the city center but it can fall more easily in the western suburbs up in the mountains. Lebanon's ski season runs from December to April. Due to Lebanon's diverse religions and sects, many public holidays are celebrated, some of which more than once: New Year's Day, Armenian-Orthodox Christmas (6 Jan), Eid al-Adha – Feast of Sacrifice, celebrating the last day of Hajj, the Muslim pilgrimage to Mecca, Al Hijrah – Islamic New Year, Feast of St Maroun (9 Feb), Eid Meelad an-Nabi – The Prophet's (Muhammad) Anniversary, Good Friday and Easter Monday (Apr), Labour Day (1 May). Martyrs' Day (6 May), Liberation of the South (25 May), Assumption (15 Aug), Eid al-Fitr - Festival of the Breaking of the Fast, All Saints' Day (1 Nov), Independence Day (22 Nov), Christmas Day (25 Dec). Based on the lunar calendar, Islamic holidays move forward approximately 11 days every Western year. Anything goes in Beirut. Shorts and T-shirts are perfect for the summer heat, for both men and women, while heavier clothing is necessary during the winter. You should cover up if visiting religious sites, such as mosques and churches. Some neighborhoods are more conservative than others, so bear that in mind when exploring the city. Going out at night is a smart affair, so dress fashionably to fit in, although this does not mean dressing up in a suit; you will find many men in sporty t-shirts, dark jeans, and smart running shoes at even the trendiest nightclubs. Beirut is very culturally diverse, quite cosmopolitan and thus multilingual. Lebanese Arabic is the native language but everyone understands (but rarely speaks) Standard Arabic, the official language, while English and French (especially the former) are also spoken by many people. Shop signs are in Standard Arabic, English, French, and sometimes in Beiruti colloquial. Most restaurant menus, event listings, and such are also in English alongside Standard Arabic and sometimes in French. Road signs, however, are in Standard Arabic and French. Entry will be refused to citizens of Israel and travellers with any evidence of visiting Israel: not just Israeli entry stamps,any products with Hebrew labelling, etc. Please check the page of Lebanon for information on visas. Beirut Rafik Hariri International Airport  (IATA: BEY), is the country's only international airport and the hub of Lebanon's national carrier, Middle East Airlines (MEA ). Most international airlines have daily flights between Beirut and the major European capitals. The airport is located 7km south of Beirut, and is roughly a 10 to 15 minute drive from the city center. Car parking is available at the airport for around 2.5 USD per hour. Please note that when parking the time is rounded to the upper hour (i.e. 1.1 hours ~= 2 hours). Hariri is one of the first airports that provided free wifi access to the internet and still does. Due to heavy charges in phone calls (Greek phone 1,23 Euro/minute to Lebanon), its best to log in to the airports wifi and use Skype mobile for the necessary calls (Taxi). At the moment, there is no public transportation to or from the airport, but there are private minivans serving as public transport across the car park in front of the airport on the only road connecting the airport with the city. You might have have to walk a little further if no buses run past you. There is no official bus company serving the airport, but private minibuses depart from the 2nd (departure) level just outside the exit. These are white and sometimes red or green minivans (majority are Kia Besta) with red plates but no numbers in their windows, which pick up airport service people and bring them to Beirut. There are no bus stops but the buses will stop anywhere where people flag them down or give them signs with their eyes. The fare to any destination is LL 1000, but bear in mind that the buses are minivans and you might be expected to pay for an extra seat for your luggage if you need one. Minibuses from the airport go to Dora (the 'o' is pronounced like the 'ou' in house and the 'r' somewhat like the Spanish, Italian, Polish or Bavarian 'r'), a suburb in the north-east of Beirut, and cross right through Beirut on their way. Ask the driver for Dora when they stop. The buses run the route Airport-Dora on the transport OpenStreetMap of Beirut which is the same as line A on the Zawarib bus map (some lines outdated! more details under the bus section on this page). On their way the buses pass the local hubs Jisr al-Matâr (Airport Bridge, but several kilometers from the airport though! 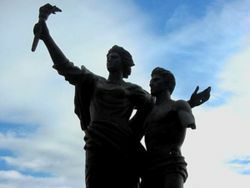 ), Barbeer, Bechâra El-Khoury, and Sâhat esh-Shuhadâ (Martyrs' Square) and then follow the coastal city highway to Dora. From the places mentioned you can catch buses going to Ramlet El-Baida, Rawche, and Manara (number 15 from Barbeer, stop around 8pm), Hamra (number 4 from anywhere between Barbeer and Sâhat ash-Shuhadâ, usually minibuses unlike other city lines, don't stop before midnight) and Achrafieh (numbers 2 and 5 from Bechâra El-Khoury, stop around 7pm) for example. After Sâhat esh-Shuhadâ on the edges of Downtown the airport buses go past Gemmayze and later Ge'itâwi, where most of the few Beirut budget hostels are located. Tell the driver where you want to get off as you enter and they will tell you once you're there. The bus service to the airport stops around 11pm and might stop much earlier in the opposite direction. At night you may be able to catch a service taxi (see below) if you walk along the only road leading away from the airport for about 10 minutes, just after passing a highway flyover. You might be expected to pay twice the service price, called "serveeceyn", to anywhere in Beirut because of the long distance. Even if you have to catch a taxi from there it will be much cheaper with no more than LL 10'000 compared to LL 30'000 at the airport. (All airport bus information as of June 2015). Uber operates in Beirut and is advantageous for tourists as there's no haggling - you and the driver get a fair price.You can choose whether to pay cash or by your credit/debit card. An Uberx from the airport to Hamra will cost around $15. There are plentiful and comfortable taxis that are authorized by the airport. They are parked next to the terminal in the arrivals level and have an airport logo on the side (official airport taxi fares ). The official price is 25 USD, or you can try to agree with any of the drivers for less. If you are not in a hurry, ask to be dropped at the closest hub, and then from there grab a "service". Prebook a taxi, at the same price as a taxi from the line, or upon your arrival in Airport simply call a taxi from a regulated taxi company which uses standard fares and a pick up from the airport will be available in 5-10 minutes after the call, at the most. Price is fixed to 30000LL (Allo Taxi) or 27000LL (Allo city smaller cabs) in May 2017. However if you want to use Allo taxi its best to pre book the taxi from their web page due to availability issues on spot, that will drug you to a more expensive Allo taxi solution which is always available. If you have pre booked Allo taxi, Go out of airport Gate 3 after you have arrived at the arrival hall cross the road towards the parking then head to the middle service room. Take the elevator or stairs to level -1 then Reach out to AVIS/Budget parking by following the signs, Allo Taxi will be there waiting for you. From city centre to airport simply stop a modern-good condition taxi and prompt the driver to ride you in airport with no more than 20000LL. He will accept, cause this is the reasonable and most used price at the moment, if you dont like to make phone calls and have a scheduled pick up. Generally taxis are plentiful in Beirut and you can find them anywhere. The above is the safest and most standard fare way especially upon your arrival to airport. After the call you will wait the taxi at exit 4 of the arrivals. They are also available and are located a little farther from the airport, but these are not guaranteed and are to be used at your own risk. The aproximate rate Airport - Hamra street is around LL 30000 as of December 2014. However, the so-called regulated taxis' drivers, will ask you anywhere between $ 30 to 50 for any downtown locations. So, start bargaining from $10 and stop at $15 as the upper limit, both ways to and from the Airport. Considering this is only a 7 km long drive, and gas price is approx $ 1.5 / litre in Beirut, this price is definitely a rip off that taxi drivers would not miss. Taxi types are wildly changing, so pick the best and newest looking ones to guarantee aircon, and collision safety in Beirut traffic. Beirut is linked with all coastal cities through the coastal road. Entrances/exists off this road connect it to districts adjacent to the coast such as Maten and Kesrwen (and others). Beirut is linked to Zahle and Baalbeck (and the rest of Bekaa) through Dahr Al-Baydar road (linked to Emile Lahoud highway at the entrance of Beirut]. You can travel between Lebanon and Syria by private/rental car, bus, private taxi, or service taxi. Note: Please stay updated with safety conditions in Syria if coming from there. There are no reports so far that border points were closed; however, check the news to stay up-to-date. As of April 2013 the road is open and safe to travel in total Syrian army control. Buses connect Beirut with Damascus and the south of Lebanon arrive at an intersection next to the Cola bridge. The bus stop is known as "Cola" among the locals. This place is in the southern part of Beirut - in area known as Mazraa. Refer to the Get Around section for information on how to get to other parts of the city. There are currently two public transport companies. The OCFTC that operates a fleet of blue and white city-buses, and the LCC  with a fleet of red and white minibuses; Bus fares cost either 500LL (OCFTC bus 24) or 1000LL ($0.33 to 0.67). The service is very efficient and the buses come very often. To get onto a bus you must stand at the side of the road and signal with your hand as a bus approaches; the buses will stop anywhere. The service of the numbered big buses halts between 7 and 8 at night whereas the minivans go at least until 11pm. The minibuses running along line 4 run all night but stop at the northern end of Damascus Street and don't go all the way to Hamra. Unfortunately, the bus companies don't provide any helpful information neither on the internet nor through printed maps of the lines and the bus lines underlie constant change. The Beirut transport map of openstreetmap is the most accurate bus map as of June 2015. To get a brief overview there is also a 2013 bus map by Zawarib, but it isn't up to date any more. Apparently, line number 5 connecting Ain Mreisse and Choueifat, line 7 and line 8 don't exist any more. Lines still existing as of April 2015 are lines 2, 4, 5 (Hamra-Jdeide), 6, 12, 15, and 24. Now there is also a seaside ('bahry'/'ba7ry') number 15, so don't be surprised if you find a bus with a big 15 in the front screen running between Ain el-Mreisse and Dora along the shore and make sure which one you enter when you're east of Beirut river. To make matters more complicated there are also inter-city buses sporting the same numbers so you might find a bus number 6 for example in a very different area (such as Hazmieh) than expected and some private school buses sometimes also have numbers in their front screen. But don't worry, it's not so bad because bus drivers and fellow commuters are very helpful and ready to give advice and everybody knows about those difficulties and is confronted with them. Just give the bus drivers a sign to stop and ask for your destination as it is common in Beirut. There are also minibuses, usually white, sometimes red or green, connecting different destinations. Some of those buses run the same route as the official line 4 and they also sport a big red 4 in their screen. Most of them don't have numbers though, and you have to know respectively ask where they go. It's best to ask people waiting for a bus or a taxi by the roadside or the bus driver how to get to your destination. Service (pronounced the French way [ser'vees] but with a rolled R) is a very common form of transport, especially with daily commuters. They are regular taxis which operate as shared taxis and cost 2000 LL compared to up to 10000 LL for a cab. Taxi drivers decide on the spot to operate as a shared taxi. A driver will try to pick up more passengers along the route, but often you will go all the way by yourself. Service drivers may choose not to take you if you are not going in the same direction as them. They also won't go the shortest way, but take some small detours in search of more passengers. Hailing a service or taxi usually entails yelling your destination to the driver when he slows down. It is important to remember that if you want a service you should give the name of the general district you want to go to and not a specific address. If the driver nods or gives you a sign to get in when they stop for you this means they accept the service price of 2000 LL. If they don't accept they will drive by or tell you "serviceyn", "taxi" or the amount they want to have and which is up for negotiation then. When you get close to your destination the driver will ask you where you want to get out. It's handy to know a landmark close to your destination as the drivers usually only know the names of the main roads and use landmarks for navigation instead. The service drivers will not take you to the exact address, unless it's on a main road, but will drop you at the closest point of the main road and will tell you in which direction to go. Of course you can also ask to be dropped off once you recognise the area you want to be in. When you enter the car you can ask "service?" to make sure you only pay 2000 LL, but if the driver doesn't tell you a price right away this means they accept the service price and you should by no means feel obliged to pay more once you get off. People usually pay when they get off. Taxi drivers in Beirut are notorious for overcharging tourists much more so than in neighboring Syria. Most will demand absurd fares and demanding 2-3 times the service rate is very common. If you're pressed for time paying the double service price, called "serviceyn" may be a compromise (4000 LL), otherwise you may have to wait a bit to find an honest cab driver willing to take you for 2000 LL. Virtually no one tips cab drivers unless some extraordinary service has been rendered, like a very long wait time while you run an errand or something. Some drivers will ask you for a tip particularly near holidays. Payment is usually at the end of the journey. There are two types of taxis in Beirut; the (sometimes old and battered) hail-taxis, and the prebooking taxis. Hail-taxi - The most convenient form of transport in Beirut, as they are absolutely everywhere. Those taxis are predominantly Mercedes Benz cars (though recently, due to increasing petrol prices, taxi drivers are opting for more economic forms or transport) and can be quite easily identified by their yellow illuminated taxi sign on the roof and red number plate. Fixed meters aren't provided so it is recommended to ask how much your trip will cost before hopping in. The fare will be charged per destination and not per distance traveled (which is an advantage since traffic is a big problem in the city). A typical journey from one side of Beirut to the other (roughly 3 km) may cost LL10 000 (€5.00). Many taxi drivers speak at least a few words of English and French. Knowing the name of your destination in the local language may solve any misunderstanding. Keep in mind the names of the landmarks around the city, as they will come in handy when traveling by public transport (some drivers aren't that good at orienting!). Prebook taxi - These require that you call them and book a ride, they generally cost more but are much more luxurious and are normally air conditioned. All hotels should provide you with a taxi directory, if you wish to use this type of service. Taxi prices are considered cheap if compared to US and European taxis. Major taxi companies are: Geryes Taxi (00961-1-332747), Taxi Premiere (Tel 1260 or 00961-1-389222). Allo Taxi (Tel 1213 or 00961-1-366661)or book online to avoid phonecalls cost. Uber has been available in Beirut for some time now. The advantages are: a) Uber calculates the fare based on distance and time, there is no negotiating a price with the driver which is especially useful as a tourist who doesn't know the distances and prices in the city b) no messing around with cash or tips, Uber will just charge your credit or debit card c) you get an email receipt with a map tracing your journey, so you can check you haven't been "taken for a ride" like you might experience in a normal taxi. Driving in Beirut is not to be recommended for much of the day, particularly in the city center. Traffic is heavy, and impossible during rush hour. There is so much to see and being stuck in a traffic jam is the last thing anyone would want to spend their time doing. Walking around the city is much more of an experience, and is in fact necessary in the very center since that part of the city is a pedestrian area. It can be difficult to find parking other than in multi-story and off-street car parks. On-street parking, if you are lucky enough to find one, is allowed for a short time of two hours. Tickets must be purchased through the parking meters usually located at either end of a street. They can be paid by either cash or card. Overstaying your time may get you a ticket. Enforcement of the parking limit isn't done very efficiently, but obviously the last thing anyone would want to find is a ticket that will ruin their day and set them back financially. As all major towns and sights are easily accessible by public transport renting a car is recommended only if you're planing to go out into the countryside where public transport isn't operating, or maybe simply to enjoy the Lebanese "see-and-be-seen" lifestyle. Car rental prices range from economical 40.000L.L/day (€20.00/day) to luxury and exotic standard prices. Those can change according to season, so make sure you contact the car rental company beforehand to check prices as well as pickup/drop-off locations. If you are traveling to the country during high season make sure to book your car rental in advance since it is normal to find that all rental companies are completely booked. Driving in Beirut is on the right-hand side of the road. Only the central areas of Beirut have traffic lights operating, though plans have been made to cover all of the city. Beirut is not a bike friendly city and you will hardly see people riding bikes apart from the wide sidewalk by the shore. There are some bike rentals though for the brave and the shore-cyclers. Every month a small group takes part in the worldwide Critical Mass rides. As the city is quite compact, walking is the best way of getting around, and perfect for getting off the beaten track to find unexpected surprises. Most people however will not walk throughout the city, rather they will walk within certain districts and take cars/taxis to get from one district to another. Streets are poorly signposted, often giving a number instead of the street name you will have on your map, and few Beiruti locals would know how to navigate according to their names. Directions are usually given by building placement and landmarks ("straight down the road until you reach building X, turn left there, then right..."), and many streets have local nicknames that wouldn't match the map either. That said, if you find yourself lost in the streets, simply ask any passer-by for directions; no one will refuse to help! Otherwise you can stop at the nearest hotel or shop and ask. Hotel concierges and shop keepers will most definitely speak at least some English. Some roads and especially pavements in Beirut are in poor condition. Not so much in Downtown, but especially the farther you get from Downtown the more road works you will most probably find. Very often the pavement is used as a parking lot or it will feature a huge trash container, a street sign, a street light or some other pole right on it making it difficult or impossible to pass. So do it as the locals and walk on the streets next to the cars. You can always check out a Beiruti-run walking tour called Walk Beirut. They offer weekly tours around the city. Beirut was once the self-proclaimed "Paris of the Middle East". It still has an outdoor cafe culture, and European architecture can be found everywhere. Many Beirutis (as well as other Lebanese) speak French and/or English, to varying degrees, along with Arabic. Each district has its own sights and places to visit. The following listings are just some highlights of things that you really should see if you can during your visit to Beirut. The complete listings are found on each individual district page. Pigeon Rocks (Rawcheh District) A monumental natural arch jutting up from the Mediterranean. Great place to sit at one of the roadside cafes and watch the sun set.There is a trail that leads in the beach in front of the Rocks.Locals are offering boat ride in and around the Rocks with small fishing boats. If you dare enough to trust them go but deal the price from the start in order you not overcharged. Place de l'Etoile (Nejmeh Square)(Downtown District), originally built by the French in the early 20th century in the very center of the Downtown district, it suffered a lot of war damage during the war but recently has been restored.In the centre of the square it stands the Greek Orthodox Cathedral of Saint George which is the Mother Cathedral of Orthodox community in Beirut and the oldest church of the city.The Cathedral is attached with an underground small crypt Museum which confirms the religious use of the area in the previous centuries. Martyr's Statue Downtown Martyr's Square, east of Nejmeh Square towards Ashrafieh. Jeita Grotto is a compound of crystallized caves in Lebanon located 20 km north of Beirut in the Valley of Nahr al-Kalb (Dog River). This grotto is made up of two limestone caves, upper galleries and a lower cave through which a 6230 m long river runs. Geologically, the caves provide a tunnel or escape route for the underground river. In this cave and galleries, the action of water in the limestone has created cathedral-like vaults full of various sizes, colors and shapes of stalactites and stalagmites, majestic curtains and fantastic rock formations. The total length of the cave is more than 9000 m and there is one among the biggest stalactites in the world hanging 8,20 m. The grotto accommodates a huge hall with a distance of 108 m from the ceiling till the water level. Open Tuesday-Sunday 9am-5pm. Adult LL 18'150. 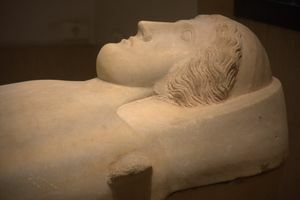 National Museum Of Beirut  (Ras El Nabaa, South Ashrafieh) About 1,300 artifacts are exhibited, ranging in date from prehistoric times to the medieval Mamluk period mainly dealing with Lebanon's Archeology and History. A few minute video is played every hour exactly and showing the history of the museum, especially the damages during the civil war, measures undertaken to protect the antiquities and the later restoration procedure with original video footage from that era. Tu-Su 9am-5pm, closed Mon and Holidays, Fee: 5.000L.L (adult), 1.000L.L (students, under 18). Emmagoss Gallery, School, New Jdeideh, Greater Beirut, ([email protected]), . edit. For a guide to Beirut's parks visit Beirut Green Guide. Horsh Beirut  (Beirut Pine Forest), (adjacent to the Beirut Hippodrome south of Ashrafieh); this park is now open since september 5, 2015 to the general public. Herbal Garden Riad El Solh St. Downtown. Beirut International Film Festival, . Held annually in October, the Beirut Film Festival exhibits films from all over the middle east, usually in either Arabic or French. The films vary enormously and some can be intensely political. Beirut International Jazz Festival, . Held annually during the month of July over a period of four days, some of the greatest international jazz artists as well as musicians from around Lebanon play some quality music near the Beirut marina. Festival du cinéma francophone , Held between the month of march and April over a period of two weeks, films are in French. Cinéma Métropolis - Masrah Al Madina, Beirut, (tel: 00961 1 293 212). One Big Sunday, Beach party with live DJs held every Sunday during the summer months in various resorts and beaches, organised by Mix FM. Bacardi Night, Annual festival held during the summer with some of the hottest DJs and bands from around the world, organised by Mix FM. A Beach Club in Greater Beirut. Most do not offer a sandy beach, however. Walk, jog, skate, cycle, stroll (or whatever you consider exercise) along Paris Avenue which links up to General De Gaulle Avenue (both locally known simply as the corniche) which stretch around the entire Central Beirut perimeter (approx. 5km). Start the walk, jog, skate etc... at the Beirut marina (Downtown Beirut District) about an hour or so before sunset and finish at the Pigeon Rocks in Rawcheh, in time to watch the sun go down while sipping on a drink at one of the outdoor cafés. Explore the night life in the many bars in Mar Mikhael, Hamra, Gemmayze, or Monot Street and get in touch with the cosmopolitan and open clubbers and staff. Try your luck with the Lebanese National Lottery, la libanaise des jeux Lebanon Lotto & Lotteries. 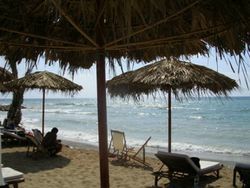 Soak up the sun on the public beach Ramlet al-Baida or in one of the beach clubs on the Beirut coast. Very few actually have sandy beaches, and most unfortunately have been converted into spas with swimming pools and paved terraces, but despite all that, they all have access to the sea. A few of them are completely private and members-only, but can be accessed by paying for a guest ticket if going in with a member. The Saint George Yacht club in Ain El Mreisseh and the Riviera Beach and Yacht Club at the Riviera Hotel are two such popular clubs, where access to the beach club for non-members is US$20 per day. You can chill in one of the pools or have a drink at the bars and cafes while listening to music in the afternoons. Long Beach Club is another good place. The entrance is just to the left of the Ferris wheel on the Cornich right before the hill. Bring a beach towel. NISD (National Institute for Scuba Diving) , Solidere Beirut Marina, Downtown Beirut, P.O. Box : 113-6691, (+961-3-204422) (email: [email protected] fax: +961-1-739206). LD (Lebanon Divers) , Mardelli Building 2nd Floor, Saide Street Ashrafieh - Beirut, (00961-1-322826/00961-3-602614) (email: [email protected] fax: 00961-1-329441). Atlantis , Bel Azur Hotel, Jounieh, Greater Beirut, (email: [email protected]). Bet on an Arabian thoroughbred every Sunday in the Beirut Hippodrome, officially called Hippodrome Du Parc De Beyrouth . The hippodrome is home to popular horse races, attracting a dedicated betting crowd (often old taxi drivers). Foreigners should join the fun in the afternoon for free entrance (ID or passport required). Open on Sundays only. AUB - American University of Beirut - The American University of Beirut (AUB) was founded in 1866 as a private, independent, non-sectarian institution of higher learning, functioning under a charter from the State of New York. AUB has grown from 16 students in a rented house to a major university with over 6,900 students located on a 73-acre campus overlooking the Mediterranean Sea. The University is governed by an autonomous Board of Trustees comprised of international leaders in business, education, diplomacy, engineering, philanthropy, science, and medicine. LAU - Lebanese American University - The Lebanese American University is an American institution chartered by the Board of Regents of the University of the State of New York and operating in Lebanon. Currently, LAU has two campuses: one located in Beirut, and a second in the Mount Lebanon city of Jbeil (Byblos). The university offers programs leading to Associate's, Bachelor's, and Master's degrees in the arts and sciences, and Doctorates in Pharmacy. LAU is the only institution outside of the United States with an ACPE-accredited pharmacy program. LAU is currently a candidate for accreditation by the Commission on Institution of Higher Education of the New England Association of Schools and Colleges (NEASC). USJ - Université Saint-Joseph - A private university founded in 1875. A member of the Association of Arab Universities, the International Association of Universities, the Association of French speaking universities (AUPELF) the International Federation of Catholic Universities, the European Federation of Catholic Universities, the Association of Jesuit Institutions of Higher Learning in Europe and Lebanon and the Euro-Med University (Téthys). Lebanese University - Lebanese University - The Lebanese University (Arabic: الجامعة اللبنانية‎, French: Université Libanaise) is the only public institution for higher learning in Lebanon. Founded in 1951, it has 17 faculties as of 2006 and comprises various cultural, religious, and social groups of students and teachers. ALLC International House Beirut  International House Beirut is the only school in the country to offer speaking-only courses in the Lebanese dialect, as well as the Cambridge CELTA (Certificate for Teaching English as a Foreign Language). IH Beirut also provides classes in Spanish, French, Italian, German and Modern Standard Arabic. ALPS Academy of Languages and Practical Skills  ALPS is a program of the Institute of Middle East Studies (IMES) in Mansourieh and offers one-on-one tutorials and group classes. It also offers a weekly conversation class in Lebanese Colloquial for free to which people who don't study at ALPS the are explicitly welcome. Saifi Institute for Arabic Language  Saifi Institute is the most well known of Lebanon's Arabic language schools. It is located in the Saifi Urban Gardens campus in Beirut's Gemazye district, which includes a cafe and student accommodation. Saifi Institute hosts around 120 students per 5-week term throughout the year. Courses are offered in the spoken and written communication of daily life (Saifi's own curriculum called "Urban Arabic"), as well as Modern Standard Arabic. Berlitz Lebanon Arabic Program  Berlitz Lebanon is specialized on teaching Modern Standard Arabic (Fussha) and Levantine dialect (Spoken Arabic) which includes also the Lebanese coloquial language. Their center is located in the university district of Hamra, close to the campus of the American University of Beirut and classes start throughout the year. Lycee Abdel Kader - A private French Lycee in the traditional area of Karakol El Druze near Beirut downtown: it is particularly known for offering French and Lebanese baccalaureates and for its highly competent students and staff. It is ranked among the top 5 private schools in Lebanon with a 100% success rate in the French Bac. There are several shopping districts around the city. Downtown Beirut - The recently renovated city center that boasts fancy and designer stores. Hamra Street - An area featuring much revitalization over the last few years, with many international and upscale brands returning to the district. Mar-Elias Street - A busy street towards the south of Beirut. Many of the shops are Lebanese brands which means this is the perfect place to find bargains as most brands are local and cheap. Rue Verdun - A shopping street with several high-end shopping malls and department stores. ABC Mall, Achrafieh Alfred Naccache Street, Mar Mitr, 00961 1 212888 . Many international brands are here along with great restaurants, cafes, and a movie theater all in a mixed indoor/outdoor setting. Souks de Beirut is a new mall in downtown with international brands in an outdoor setting. Beirut Mall, Tayouneh roundabout, 00961 1 385888, . ABC Beauté, Bab Idriss, downtown, 00961 1 991888. Offering a wide range of international cosmetics and perfume brands, nail bar, professional hairdressers and stylists. Open Mon-Sat 10AM-7PM. Miss ABC, Hamra street, facing Cinema strand, 00961 1 344740. Women's specialty store. Open Mon-Sat 9:45-7:45, closed Sunday. City Mall, Dora highway roundabout, Greater Beirut, 00961 1 905555. Includes 100 stores, 15 cafes and restaurants, a Hypermarket, and 9 movie theaters. Dunes Center, Centre Dunes, Verdun Str., +961 1 785310, . Displaying some of the latest shopping brands, as well as many cafes and a movie theater. Virgin Megastore - Currently four branches in Beirut: Beirut International Airport, Martyr's square Downtown (claims to be the biggest Virgin Megastore outside the UK), City Mall (Dora roundabout), ABC department store (Ashrafieh). Music, Books, Event Tickets: Virgin Megastores Currently four branches in Beirut: Beirut International Airport, Martyr's square Downtown (claims to be the biggest Virgin Megastore outside the UK), City Mall (Dora roundabout), ABC department store (Ashrafieh). Flea markets are surprisingly hard to find, occasional organized markets are held that are made to resemble flea markets. Souk El Tayeb Held every Saturday near BIEL downtown between 9AM-2PM, feed your soul as well as your face in Beirut's first organic farmer's market. Promoting traditional methods of farming and preserving, it's a great place to pick up local honey, cheese and breads, plus artisans' crafts. It also runs regular cookery classes, to learn how to make that perfect tabouleh (bulgur salad). Sunday Market (Sou al-ahhad in Arabic (the 'q', 'qof' in arabic is rendered either silent or as a glottal stop in Lebanese) Get up early and join the locals for a rummage at the Sunday Market which opens between 7AM and 1PM, next to Beirut River in the east. You might find antique jewellery, clothing and beads, or maybe just bric-a-brac, but there's an eclectic selection of goodies on show. Remember to bargain hard! Burj Hammoud Beirut's Armenian quarter, perfect place to shop for cheap bric-a-brac, artisan's crafts, souvenirs, copper and brass ware and faus-brands. Don't forget to haggle. Burj Hammoud is located to the East of Ashrafieh across the Beirut river. Lebanese Pounds (LBP) are also referred to as Livres Libanais and Lebanese Lira. US Dollar (USD) notes/bills are widely accepted, but US coins are not. For the US Dollar the exchange rate is fixed at 1USD = 1500LBP (as of January 2017). Once payment is made in either currency, change will be given in Lebanese Pounds or, possibly, a combination of both US Dollars and Lebanese Pounds. Payment cards: Many shops, hotels, restaurants, bars etc accept international payment cards such as Visa, Mastercard, Maestro or American Express. But don't be surprised if your credit card turned down, it is a common occurrence; certain cafes have a reputation of having rejected every credit card they've ever swiped. Automatic bank tellers: Withdrawal can be made from any automatic bank teller found in any region of the country. Withdrawals can be made in either Lebanese or (usually) the US dollar. Traveler's checks: Lebanese banks can exchange them very easily. Lebanese cuisine is a mix of Arab, Turkish, and Mediterranean influences, and enjoys a worldwide reputation for its richness and variety as well as its Mediterranean health factor. Olive oil, herbs, spices, fresh fruits and vegetables are commonly used, as well as dairy products, cereals, fishes and various types of meat. A visit to Beirut includes the traditional Lebanese Mezze (Meza), an elaborate variety of thirty hot and cold dishes. A typical Mezze may consist of salads such as the Tabboule and Fattouch, together with the dips: Hommos, Moutabal, Muhammara, and more, and some patties such as the Sambousseks and finally, the stuffed grape leaves waraq 'inab, with of course the Lebanese flat pita bread which is essential to every Lebanese Mezze. Lebanon is a great country to eat vegan since many dishes, especially those part of Mezze, are traditionally made without animal ingredients. Not to speak about the delicious fresh fruit and veg. Some of the sweets are also vegan, depending on the confectioner. Manqoushe (pronounced "Man'oushi"): A Lebanese pizza, or at least that's what it looks like, the Manqoushe is a baked flat dough with either a mixture of local cheeses or thyme (za'atar) (or a mixture of both) on top. There is also a sweet version of it where the dough gets covered with a sugar and cinnamon mix before being baked. You can also get it with spinach (sabanikh), where the dough is wrapped around the spinach filling giving it a triangular shape. The one with spinach comes in a big and a small size. Manqoushe can be bought from all bakeries as well as from Forn Manqoushe, which specialize in this type of food and is usually had for breakfast. Costs between 500 LL and 3000 LL. The za'atar, spinach and sugar Manaqeesh (plural of Manqoushe) usually are vegan, but sometimes the dough is made with milk. Tabboule: A parsley salad with mint, tomatoes, spring onions, bulghur, olive oil and lemon juice. Usually vegan. Waraq 'enab: Wine leaves stuffed with rice and spices and sometimes with tabboule before being pickled. Eaten cold. Usually vegan. Ka'ek: A different version of the classic bagel, only about a foot in diameter and hollow, normally filled with thyme but you can ask for cheese spread as well. The most common place to buy these are from the local street vendors that ride bicycles or motorized scooters and honk a manual horn, but you can also find it at major bakeries. Although not of Lebanese origins, they're quite popular and are always found near Rawcheh area, they're worth a try. cost about 1.000L.L . Roastery Nuts: Roasted nuts are certainly the local favorite appetizers particularly with the older people. Local brands have dedicated roasteries where customers walk in and order fresh, they produce some of the best nuts in the region, and certainly the most varied. Pecans, Cashews, Macadamias, Hazelnuts, Almonds, Pistachios, Peanuts its all there. Ask for Krikri in thyme, spice, or cheese flavor. Sweets: Every religious or national event sees stalls set up on sidewalks outside churches and in public squares, where traditional Lebanese sweets are sold such as: Maamoul, Ktaef, Halawet el Jibn, Halawet el Riz, and Ashta. If you're lucky enough to come across those be sure to give them all a try, otherwise visit any pâtisserie where the same sweets can be purchased (but of course lacking the same authenticity!). Some pâtisseries offer vegan sweets. Beirut's different cultures brought different tastes for food, and restaurants of all different origins have opened all around the city. Restaurants have different price ranges, depending of course on the quality of the ingredients used; check the different districts for the listings. If you're on a tight budget it's best to rely on fruit and vegetables and to occasionally go to one of the eateries serving Lebanese fast food such as falafel, hummus, French Fries sandwiches and of course man'oushe which is by far the cheapest option. International fast food chains are considerably more expensive, but all major international fast food chains have opened restaurants in Beirut (KFC, McDonald's, Burger King, Hardee's, TGI Fridays, Domino's Pizza, Pizza Hut, Dunkin' Donuts, Subway etc...). Many local fast food restaurants have sprung up to compete with the major franchisers. Nightlife: Alcohol is readily available in Beirut. Many of Beirut's districts have their own fair amount of cafes, bars, and clubs, although many areas are "dry" or, while serving alcohol, do not have a vibrant nightlife. This said, two of the hotter nightspots, with the highest concentration of pubs and nightclubs, are Uruguay Street in Downtown, and Mar Mikhael, both located within close range in the Ashrafieh district. Hamra has quite a few pubs and bars as well. The best way to find out what's in and whats not is by checking the local press or simply going there and seeing for yourself. There is no curfew in Beirut, though expect most pubs and bars to empty by 3:00am-4:00am, and most nightclubs to empty between 5:00am and 5:40am. During the summer, Mar Mikhael tends to be much less busy, as many open-air clubs outside of the area tend to dominate the nightlife in Beirut. Uruguay street remains popular year-round. SkyBar in Biel, just next to downtown, is an open-air nightclub. It is arguably the hottest and most expensive nightclub in Beirut, and has a view overlooking the Sea. It is closed during the winter months. BO18. A popular club inside a bomb shelter located under a parking lot. The roof opens and you can see the sky while dancing. Clubbers park in the lot and descend a staircase into the club. Yukunkun is a club that plays a variety of music from drum'n'bass and dubstep to house and disco to funk and hip-hop. Sometimes it also hosts rock concerts. It's a remarkably unpretentious and easygoing part of Beirut's club scene but doesn't lack of style and atmosphere. Überhaus. Located on the premises of the old train station in Mar Mikhael they mostly play techno. During summer they also operate the outdoor club The Gärten in BIEL. The Grand Factory is another rooftop nightclub just outside of Beirut in an industrial area of Bourj Hammoud north of the highway to Dora. The view over the port, the sea, and the mountains are spectacular. Iris. Is a rooftop bar on top of the an-Nahar newspaper building, with an outdoor area overlooking the Sea, Downtown, and the mountains. Gatsby. Is a 1920's bar & Kitchen with an outdoor seating patio, located in Uruguay street. It takes after the infamous Chicago Prohibition-era speakeasies. NU. Is a bar with an outdoor terrace located at the entrance of Down Town's Uruguay Street, NU features a unique pop culture concept with a trendy and relaxed atmosphere. Locally brewed beer include Almaza and Laziza (non-alcoholic). There is also a microbrewery that started producing several styles of more flavorful beer in 2006, called "961 Beer". In 2010, a new beer was launched called "LB Beer", which is brewed without the use of any corn or rice. it has gained a large following by the younger, independent minded crowd and is a regular staple at locally organized parties. All are worth a try when visiting. There are lots of hotels in Beirut's metropolitan area, ranging from cheap hostels to luxury suite hotels. Prices and quality vary across the spectrum, but if you look well enough, there's bound to be the perfect hotel inside whatever budget you set. Check the different districts to find places to sleep. Around 2009 Lebanon's state of affairs normalised and it became a safer place to visit following the withdrawal of Syrian and Israeli troops. The number of tourists dramatically increased to more than 2 million in 2009. More recently, the Syrian Civil War (2011-present) and International Military Intervention Against ISIL (2014-present) have occasionally spilled over into Lebanon and presented security risks. Beirut, despite being far from the border-towns, has suffered from car bombings and terror attacks in 2012, 2013 and 2014. The most recent terrorist attacks were car bombs, triggered in the southern Beirut suburb of Bourj el-Barajneh in 2015 and in the North-Eastern suburb of Hamra in June 2016. Despite the above, as of mid-2018 visiting Beirut is considered relatively safe, with most international government advisory agencies (UK Foreign & Commonwealth Office, Government of Canada, Australian Department of Foreign Affairs & Trade, France Diplomatie) advising travellers to visit whilst exercising a high degree of caution and staying up-to-date with local events. It is important to note that all advisory offices caution against all travel to the Hezbollah-controlled southern suburbs of Beirut, including the neighbourhoods of Bir Hassan, Ghobeiry, Chuya, Haret Hraik, Burj Al Brajne, Mraije, Er Rouais and Laylake. Tourists (including Lebanese expatriates) are especially vulnerable to scams in Beirut, and often these relate to overpricing. There is a broad perception that all foreigners have a wealth of riches, and more disturbingly, that they are powerless to complain in the event of being ripped off. This applies mostly to visitors from Arab countries; wealthy people often come to enjoy a free vacation to the country and are a target of scams due to their high income. A lack of regulation for many basic services in Lebanon (e.g., public transport) mean that the threat of a complaint will do little to set things straight, and your best bet is to be as vigilant as possible in the first place. 1. Let someone know where you are going and have someone expecting you on arrival. Try to avoid traveling alone. 2. Always carry your mobile phone in an easy to reach spot. 3. If traveling by taxi, always agree to the fare in advance, and pay only on arrival. 4. Ask for local recommendations on cab companies/operators - people are less likely to give you a bad experience if there's reputational damage involved. 5. In cabs, always pretend to be interested in the services of your taxi driver for future use (e.g., day rates, extended private touring) even if you are not - entertain this by asking for a contact number and tell your driver you'll "get back in touch, maybe (insert random day here) next week". If you have a good experience, it might even be a handy number to have. You may be warned about carjackings by your car rental company; a known trouble spot is the Emile Lahoud Autostrade linking Mt Lebanon (Bikfaya area) with Beirut. Heed any recent advice. Street signs in Beirut are generally poor, and those placed on motorways often provide insufficient notice of an impending junction or exit. Unless you're certain about your route, try to avoid driving at night, which can lead to hours of frustration. While the Lebanese are an affectionate (and genuinely friendly) lot, beware of anyone random introducing themselves to you on the street with a hug or a handshake that draws you in to an embrace - often with a line like "oh, its you! how are you!". The assailant then threatens the victim to hand over money/wallet/phone/jewelery in a way that avoids public spectacle. If you are unlucky enough to fall ill, head straight for the American University Hospital - aka 'the AUH' (near the AUB campus) - you will need to pay around $40 USD upfront (cash or major credit card) and be reimbursed later by your insurer. Pharmacies in Lebanon are able to prescribe drugs on-the-spot. While this is likely to be a boon for a minority of travelers, it can leave you even more ill than when you came in to begin with. Don't chance it - see a doctor first. Escaping to the mountains near Beirut is a good option for those about to burn-out. 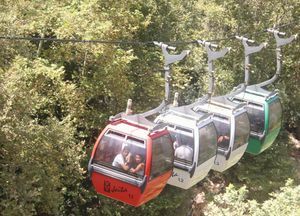 Aley and Beit Mery are both near enough to the city (at least 20-30 minutes by car, depending on traffic) and connected by buses from Dora (Beit Mery) or Cola (Aley). They are generally quiet, clean and green and are considerably cooler than Beirut. Official Newsboxes can be found throughout the commercial areas in the city, mainly in Sassine Square ashrafieh, Verdun st. Verdun, Concorde st. Hamra. All Minimarkets/Supermarkets/Hypermarkets distribute newspapers and magazines as well. The Daily Star  Independent daily English-language newspaper covering local, national and international news. Monday Morning  Independent weekly English-language journal. L'Orient Le Jour  a popular independent French-language newspaper. There is a huge variety of Arabic newspapers of all sorts, as well as ethnic newspapers such as the Armenian Aztag Daily. Once you leave Beirut, visit any of the other cities in Lebanon. The country is relatively small but because of traffic jams the journey to Tripolis or Tyr can take more than three hours. Depending on the season visiting, you can go skiing in one the six mountain resorts, or go to the beaches in Tyr or one of the beach resorts in Jounieh. Visit the national heritage sites around Lebanon; every city in the country has at least some form of ancient or historic site. Buses that head to the North city of Tripoli or to Syria and Jordan operate from the Charles Helou bus station, which is also the station for long-distance taxis that link Beirut to neighboring cities as well as Syria and Jordan. Charles Helou is located next to Port of Beirut. It can be difficult to understand the main bus routes at first but you can always ask, bus drivers are like everybody else in Lebanon, friendly and may be able to communicate in English or French. Buses that head south (Sidon, Tyr) and to the Beqa'-Valley (Zahlé, Ba'albek) leave from the Cola intersection. Buses that head north (Je'ita, Harissa, Byblos, Tripolis, Bcharré) leave from the Dora roundabout. This page was last edited on 5 November 2018, at 15:58.